Mountain Ash This tree is ‘Mountain Grown’ at Alpha Nursery and is an ‘Idaho Preferred’ Plant. Mountain Ash has grayish, yellow-brown smooth bark. Its leaves turn yellow, orange, and red in autumn. Flowers are white or pink followed by berries that are orange-red and 1/4 inch in diameter. It is a native in this area and puts on a great show in late summer through fall. It attracts wildlife, birds, butterflies, and bees. The berries are a favorite food and highly prized by the red-headed woodpecker, robin, and bluebird. 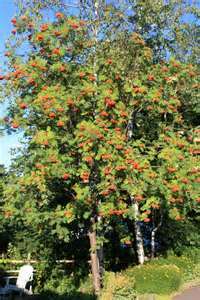 Mountain Ash is native to our area and it is also a Firewise plant. Mountain Ash likes to be planted in full sun to lite shade.